Originally published in Journal of Creation 14, no 1 (April 2000): 52-59. Any scientific understanding of the Biblical Flood must address the hydrology and sedimentation that occurred during the Flood and in subsequent years as the Earth settled down. A number of scientific models previously proposed for the Flood are summarised and assessed. Further progress will require an integrated approach from many scientific disciplines. As well as the traditional contribution from the geological sciences, coordinated inputs from a number of other disciplines will be needed such as fluid flow, heat transfer, plate tectonics, vulcanology, planetary astronomy, and mathematics, in order to build a possible Flood hypothesis. Any model for the Flood can only be speculative. A coordinated approach will impact current Flood models that have accepted the sequential nature of the geological column and that have put the Flood/post Flood boundary far down in such conjectural reconstructions. Traditionally, for scientists operating from an evolutionary premise, the geological sciences have provided the chronological framework to allow other scientific disciplines to place their data in an historical context. The main principle of uniformitarianism has motivated research into present geological processes so that rocks these scientists regard as ancient can be interpreted in terms of such processes. In the last thirty years there has been a major shift in thinking amongst evolutionary geologists with the development of plate tectonics—all modern geological processes are now seen as part of a global interaction of plate tectonics, which itself has been adopted as the interpretative geological paradigm. By contrast, scientists working from a creation perspective view all significant geological events within a Biblical chronological framework. Nevertheless, there is still a need for scientific models of these events because the Biblical record is not exhaustive, nor is it intended as a scientific treatise. In particular, creation scientists need to understand the Biblical Flood by addressing the hydrology and sedimentation that occurred during the cataclysm and in the subsequent years as the Earth settled down. Modern geological processes, while instructive, do not have the same standing as for long-age uniformitarian scientists. This is because geological processes during Creation and the Flood were different from what we observe today. So creationists have a greater need to develop an integrated approach from many scientific disciplines. As well as the geological sciences, inputs from many other disciplines are needed, such as fluid flow, heat transfer, plate tectonics, vulcanology, planetary astronomy, and mathematics. In this paper we summarise the current state of a number of scientific models that have been proposed to describe the world-wide Flood and to integrate our understanding of science from the Biblical perspective. The vapour canopy model of the Flood is the one that has held greatest sway in scientific creationism since serious research began in the 1960s. The book The Genesis Flood by Whitcomb and Morris,1 first published in 1961, and Whitcomb’s later The World that Perished (1996) explain this view.2 The vapour canopy theory is that the Earth’s atmosphere was surrounded by a water vapour blanket that collapsed at the onset of the Flood. Dillow has extensively explored this concept theoretically.3 This model has led the field for a number of years, but has difficulties in accounting for the large amount of catastrophic upheaval in the Earth at the beginning and through the Flood year. Catastrophic upheaval is evident, for instance, at the Old Red Sandstone rock formation from Loch Ness to the Orkneys in Scotland where an area 2500 m deep and 160 km across, contains countless fish, buried in contorted and contracted positions, as though in convulsion.4,5 There is all the evidence of catastrophic burial by processes (it would seem) of greater power than that provided by the vapour canopy theory. Although there may be some substance in these objections to the vapour canopy proposal, it should be noted that this model of the Flood, though it predicts late drowning of creatures by rising floodwaters, should not be regarded as tranquil. Indeed in this model, the rising waters would be extremely turbulent, and probably involve vast surging tidal waves. Nevertheless it is still difficult to explain the major fossil strata by this method. One of the major difficulties raised by Flood models of fossilisation (including the canopy theory) is the problem of dinosaur nest sites within the fossil record. These certainly pose quite a difficult problem to solve in the context of Flood sedimentation. Calculated vertical temperature profile for a vapor canopy model of the Earth’s atmosphere compared with the temperature profile today (after Rush and Vardiman).50 Theoretical models of postulated pre-Flood vapour canopies are used to explore whether it is feasible to postulate significant quantities of water in the atmosphere above the Earth. In this example, only 50 cm of precipitable water is stored but this raises the surface temperature of the Earth to above 100∞C. Because of such evidence, critics of Flood fossilisation in general, and the Whitcomb and Morris model of the Flood in particular, have maintained that the Flood/post-Flood boundary is low down in the geological record, in the Paleozoic, as explained by Tyler.9 (This geological column term is used simply for communication purposes. The order of the strata may well be incorrect for reasons outlined later.) Such critics have maintained that all Flood models which attribute most fossils to the Flood, are incorrect, and propose that the Flood left no trace whatsoever of all air-breathing land creatures—the so called ‘blot out’ theory. In a companion paper,13 we give important Biblical reasons why fossils are the most natural evidence expected from the Flood. However these authors are right to criticise the vapour canopy model if it does not provide enough sedimentation to achieve such a vast thickness of fossil-containing strata. This is why we discuss other models in this paper, which, we believe, yield a more plausible picture of the Flood year. Thus the initial rupture of the Earth’s crust under this view would hurl rocks and sediments in gigantic muddy fountains of water which then lead to intense precipitation (consistent with Genesis 7 (KJV) ) for the 40 day period. These fountains would eventually be followed by many large volcanic eruptions in the ‘Ring of Fire’ around the Pacific, all with the force of Krakatoa. This volcano exploded in 1883 sending rocks and dust into the atmosphere to a height of 55 km. The explosion was so intense that it could be heard 4,600 km away. Dust fell at a distance of 5,327 km ten days after the explosion,24 and a tsunami (tidal wave) 30 metres high travelled right across the Indian Ocean at 720 km/h.25 Similarly, during the Flood, on top of the water borne sediments, and sometimes mixed with them, vast layers of magma would be poured out or catastrophically exploded into the atmosphere. The rain in the first 40 days of the Flood involved not only the return to the Earth of the jets of superheated steam ejected into the atmosphere (which would partly fall as hail and snow), but great quantities of rock debris as well. Many fossils could have formed within the first few weeks of the Flood in this model. In the next 110 days, further vast layering, scouring and re-layering of the continents would occur under the ravages of the Flood waters. The final catastrophic drainage of the waters occurred at the end of the continental drift phase when, after massive tectonic upheaval, the land eventually re-appeared as the Earth’s crust found a new equilibrium. It is significant that Genesis 8:3 (KJV) speaks of the waters ‘returning from off the earth’ (literally ‘going and returning’ in the Hebrew). Recoil phase of the hydroplate model for the geological events of the flood (from Brown).51 Rupture of the crust allows steam and sediment to be ejected as a fountain into the atmosphere, returning to the Earth as rain. The continents start to move apart. Some have criticised the rupture phase of the hydroplate model with its vast quantities of hot steam ejected at enormous speeds into the atmosphere, causing immense rainfall. However, the ‘explosive mixing of water and lava’10 targeted by these objections, is very possibly how the ‘windows of heaven’ were opened as described in the Flood account. Within the context of the hydroplate model, it is entirely feasible that many creatures would flee in vain to survive. 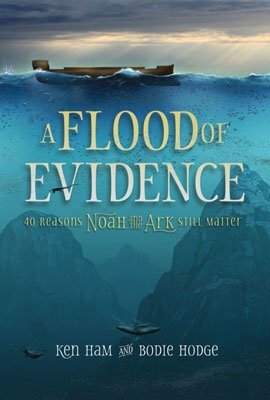 We would expect to find fossil evidence of this, such as tracks in mud subsequently covered quickly by sediment.26 Furthermore, since it was a full year before Noah came out of the Ark, there is certainly room within the Genesis account for some late-Flood and post-Flood disasters as the waters receded. Thus the Grand Canyon may well have been formed when a vast natural inland lake (left behind after the Flood receded) burst its banks and scoured out the canyon. In this process, vast quantities of silt and debris would be carried to the Pacific coast-line.27 Brown,18 describing the aftermath of the hydroplate catastrophe, agrees with Austin that the Grand Canyon formed in this way. The Toutle Canyon was observed to form catastrophically in a similar manner, but on a much smaller scale, after the Mount St Helen’s eruption in 1980. Such catastrophic processes may account for the burrows of small marine creatures in rocks at one horizon, but which are now covered by further sediments. The theory of catastrophic plate tectonics (CPT) was initiated by Baumgardner,28 and later developed in conjunction with other creation scientists.29 Reed et al. provide a good review of plate tectonics as interpreted within a catastrophic framework,30 but make the point in their conclusions that the original driving mechanism behind continental plate displacement and subduction is not known. CPT theory starts with the assumption that the Flood was initiated when slabs of oceanic crust broke loose and subducted along thousands of kilometres of pre-Flood continental margins. It is suggested that subducting slabs of material locally deformed and heated the mantle, locally lowering its viscosity. With lowered viscosity, the subduction rate increased—and this in turn caused the mantle to heat up even more. This, it is argued, led to a thermal runaway instability, and allowed subduction rates of metres per second. Baumgardner shows that rapid, large-scale subduction would furthermore initiate global-scale flow of the mantle beneath the Earth’s crust. This in turn would cause strong convection currents in the Earth’s outer core and explain how geomagnetic reversals took place.31,32 Magnetic reversals of course had been thought to have taken place slowly over millions of years on the evolutionary geological timescale. However, the extension by Humphreys of the CPT theory of Baumgardner to account for the Earth’s magnetism gives an underlying cause for the quick reversals. In that evidence for rapid reversals has been discovered in thin lava flows, the magnetic field deductions from CPT theory gives considerable confidence in the theory of continental plate collision and subduction as being a primary mechanism for major global upheaval during the Flood. Runaway subduction of the oceanic plate into the Earth’s mantle drives metres-per-second motion of the rigid lithospheric plates in the catastrophic plate tectonic model of the Flood. He then asks where the pre-Flood seafloor went. The model convincingly suggests the answer that the original sea-floor was catastrophically subducted, so that we now have a relatively new sea-floor—formed as igneous flows from the Earth’s mantle deposited in very thick (five kilometres or so) layers at the bottom of the present-day oceans. The hydroplate theory previously discussed and CPT are usually regarded as mutually exclusive. But this need not be so. There is considerable room for volcanic activity during the continental drift phase of the hydroplate theory.33 The breaking of the Earth’s crust (possibly by an impact) may well have released large volumes of subterranean waters into the atmosphere, and led to the rapid movement of the broken continental plates from the impact centre. Subsequently, a subduction mechanism may then have taken over from the initial catastrophe, driving continuous upheavals in the Earth’s mantle under the seas, and sustaining the disaster for the rest of the Flood year. Temperature profiles associated with subduction of oceanic slab into the mantle of the Earth (from Baumgardner).52 Computer models of the Earth’s mantle demonstrate the conditions that would be necessary to initiate runaway subduction. Guy Berthault has produced some landmark research into sedimentology. First on a small scale, but more recently on a larger scale, he has studied the deposition of heterogeneous mixtures from flowing water.34 His results indicate that different sediment layers do not deposit one after the other in a vertical direction, but all at the same time horizontally.35 Applying these findings to the Grand Canyon, the different layers would have been deposited under strong water currents and laid down horizontally, not vertically. Thus many of the layers of the canyon would have been deposited simultaneously, and do not necessarily represent different periods of time. If proved, this has immense implications for the whole theory of sediment formation world-wide. Clearly we must avoid saying that all sediments were laid down this way. The vast coal seams would be one example of deposition in a non-flowing environment. However Berthault’s sedimentology experiments have overturned previous belief that layers form one after the other in stages. Such surprising results may help us understand why the apparent order of the so-called geological column is reversed in some parts of the world. Furthermore it is interesting to note that the preliminary results of the work by Baumgardner and Barnette support Berthault’s basic premise.36 They considered the simplified problem of a shallow, homogeneous and inviscid fluid (water) flowing over a rotating sphere. Their fully transient solution to this problem produced some unexpectedly fast flowing regions of strong cyclonic gyres with velocities of 40–80 m/sec. The effect of such fast flowing currents on deposits of material carried with the water is not yet understood, but this shows that there is a great deal to be done with heterogeneous flows where the shallow water assumption is lifted. Generic studies, both experimental and numerical, are needed. A method for classifying rock formations without direct appeal to the geological column (with collapsed time-scales) has been proposed by Walker.37 This method advocates different types of flood formations as the waters rose and subsided. The hydroplate method or Baumgardner’s approach can both be used as possible driving mechanisms for the Flood within such a classification. It is vital to remember that no one theory is probably entirely adequate to reckon with all the data, but nevertheless, one can speculate about possible answers to perceived problems. For example, Garner has rightly pointed out the difficulty with certain basalt flows appearing ‘late on’ in the supposed geological column.38 Since these seem to require a sub-aerial environment, one can understand his conclusion that the post-Flood boundary must be earlier than the basalts. Thus with the water drained from the land, the subsequent volcanic activity in the Mesozoic and Cainozoic would be sub-aerial. But if we accept the hydroplate model of the initiation of the Flood, then the first 40 days would involve immense destruction consistent with the Paleozoic (some even include most of the Precambrian39) record. The waters of the oceans were still rising, parts of the land were still not covered entirely by water—there may even have been a brief lull. Certainly this is not inconsistent with the account in Genesis 7:17–24 (KJV) . In the next 110 days, immense volcanic upheaval occurred on the land masses, but still not all the land was finally covered. At the same time, upheavals of the land masses were also occurring, so that some of the land that had been covered was exposed, albeit briefly—of the order of weeks. It is conceivable that dinosaur tracks could have been made in this time. Garton rightly points out that these dinosaur tracks go right through the Mesozoic and into the Cainozoic.7 Under our scenario, tracks in the Mesozoic are consistent with ground still being available at the late stage of the 150 days. Some tracks may already have been made earlier, just after the 40 days’ initial onslaught, and then pushed upwards when the mountains rose. Similarly, tracks showing no sign of chaotic motion in the Pyrenees in Spain40 may also be at the late stage of the 150 days, again pushed upwards as the mountains rose. Finally the waters with vast amounts of debris and sediment overpowered these large creatures which, not surprisingly are buried in the same part of the strata as the later tracks and usually ‘higher’ up the column. We do not claim that such a scenario explains everything. There is a vast amount of work still to be done to understand the mechanisms involved. But we suggest that a willingness to expect and look for the unusual is always important for advance in scientific research. Dinosaur tracks and nests during the Flood? However, the model suggested by Robinson, Garner, Garton and others involving many post-Flood catastrophes gives no real answer either to the sudden death of dinosaurs in the Cretaceous. Their post-Flood fossilisation hypothesis, in our view, becomes a serious scientific problem. Marine fossils are found high up in mountains in the Alps, often deposited with great violence (as suggested by the Jurassic marine fossils at lower altitude on the North East Coast of Yorkshire near Whitby). The burial of large dinosaurs, by their thousands in Alberta and Montana,6 South Dakota, Kansas and Colorado42 with vast continental sedimentation (in some places thousands of feet thick) would not be possible without causing gigantic upheaval in other parts of the Earth. It seems inconceivable that post-Flood disasters could deposit such thick strata without causing violent effects all round the world. The scale, depth and the sheer number of fossils argues strongly that these must be part of the Flood. Rather than forcing the interpretation of mabbul to mean the removal of all possible evidence of any creatures (the ‘blot out’ theory—to allow suggested post-Flood activity), it seems wiser to question whether we have properly understood the scientific evidence. In his article, Robinson states that Oard’s post-Cretaceous model for the Flood/post-Flood boundary is ‘not a straightforward interpretation of Scripture’.43 He argues that the position on the geologic column whereby the Flood killed the dinosaurs is ‘a paradigm constraining the interpretation of Scripture’. However, the alternative position he advocates, of entirely blotting out all animal remains without trace is, in our view, forcing a tenuous meaning on the word mabbul. This and the requirement of post-Flood disasters on a continental scale are leading to a much greater difficulty in the natural interpretation of Scripture. It seems clear that some dinosaurs must have been buried by catastrophic waterborne sediment. It is therefore entirely conceivable that further giant mudslides trapped the dinosaurs as the rafts struck land in the final stages of the 150 days, or that some escaped onto land, only to be buried as the rising waters finally covered the land. The burial of birds in the later strata is all consistent with the final stages of the 150 days, where no land was available. It is important that all scientific disciplines be utilised to understand the possible processes of the Flood. It is not only geology that should be considered. Hydrodynamics also must play a part in understanding sedimentation processes. Berthault has rightly stated ‘Determination of initial hydraulic conditions from sedimentary structures, resulting from sedimentological data is, therefore, a research priority.’ 49 Today, in the experience of the lead author (in fluid dynamics and thermodynamics research), a multi-disciplined approach is usually needed before scientific advances can be made in the understanding of complicated and unusual phenomena. Progress is not generally possible when it is insisted that only experts of one discipline can solve the underlying physics of a particular problem. The modelling of the flow of heterogeneous mixtures with the full laws of conservation of energy, mass, momentum, is one of the greatest challenges that computational fluid dynamics has faced. A very careful and thorough approach is demanded when the particle size of the material carried with the water varies widely. The problem involves materials of different densities, different viscosities, with very large variations in local Reynolds number (convection divided by viscous diffusion) and hydraulic conditions. Furthermore, boundary layers have to be modelled with particular attention to the possible change from turbulent to laminar flow. The experiments of Berthault have already clearly shown that surprising lamination can occur in the sediment deposits from such flows. These conditions now need to be modelled by fluid dynamicists and mathematicians, so an understanding of the larger picture can emerge by carefully constructed mathematical models. On the larger scale modelling of solid earth geophysics, we acknowledge the impressive work already under way with the investigations of Baumgardner and Barnette.36 Interaction between geologists and other scientists (particularly those researching in fluid dynamics), is essential if there is to be progress in Flood geology, beyond (the not unnecessary) basic description of what rocks and fossils are found at particular locations. Only as there is greater interaction between the relevant scientific disciplines will some of the unanswered problems of the Biblical Flood models be solved. Whitcomb, J.C. and Morris, H., The Genesis Flood, Presbyterian and Reformed Publishing Company, Phillipsburg, 1961. Return to text. Whitcomb, J.C., The World that Perished, Revised Edition, Baker, 1996. Return to text. Dillow, J.C., The Waters Above: Earth’s Pre-Flood Vapour Canopy, Revised Edition, Moody Press, Chicago, 1982. Return to text. Milton, R., The Facts of Life—Shattering the Myth of Darwinism, 4th. Estate, London, pp. 85–86, 1992. Return to text. Trewin, N.H., Mass mortalities of Devonian fish—the Achananas Fish Bed, Caithness, Geology Today, pp. 45–49, Mar/April, 1985. Return to text. Garner, P., Where is the Flood/post Flood boundary? Implications of dinosaur nests in the Mesozoic, CEN Tech. J. 10(1):101–106, 1996. Return to text. Garton, M., The pattern of fossil tracks in the geological record, CEN Tech. J. 10(1):82–100, 1996. Return to text. Tyler, D.J., A post-Flood solution to the chalk problem, CEN Tech. J. 10(1):107–113, 1996. Return to text. Tyler, D.J., Flood models and trends in creationist thinking, Creation Matters 2(3), 1997. Return to text. Robinson, S.J., Was the Flood initiated by catastrophic plate tectonics? Origins 21:9–16, 1996. Return to text. Robinson, S.J., Can Flood geology explain the fossil record? CEN Tech. J. 10(1):32–69, 1996. Return to text. Other objections to the vapour canopy model concern the latent heat of such vapourisation—see Vardiman, L., An analytical young-earth flow model of the ice sheet formation during the ‘ice age’; in: Proceedings of the Fourth International Conference on Creationism, Pittsburgh Pennsylvania, pp. 561–568, 1994, and Vardiman, L., A conceptual transition model of the atmospheric global circulation following the Genesis Flood; in: Proceedings of the Fourth International Conference on Creationism, Pittsburgh Pennsylvania, pp. 569–580, 1994. Return to text. McIntosh, A.C., Edmondson, T. and Taylor, S.C., Genesis and Catastrophe, CEN Tech. J. 14(1):101–109, 2000. Return to text. Froede, C.R., Sequence stratigraphy and Creation geology, Creation Res. Soc. Quart. 31(3):138–147, 1994. Return to text. Froede, C.R., A proposal for a Creationist geological timescale, Creation Res. Soc. Quart., 32(2):90–94, 1995. Return to text. Woodmorappe, J., The geologic column: does it exist? CEN Tech. J. 13(2):77–82, 1999. Return to text. Berthault, G., Experiments in Stratification, Sarong Productions, Jersey, video, 1999. Return to text. Brown, W., In the Beginning: Compelling Evidence for the Creation and the Flood, 6th (special) edition, Centre for Scientific Creationism, Phoenix, Arizona, 1996. Return to text. Selbrede, M.G., Dr Walt Brown’s Hydroplate Theory, Chalcedon Report (Sept.), pp. 37–45, 1998. Return to text. Brown, W., The Young Age of the Earth, Alpha productions, video. Return to text. Brown, Ref. 18, pp. 86–92. Return to text. Brown, Ref. 18, p. 88. Return to text. Brown, Ref. 18, p. 91. Return to text. McWhirter, N. (ed. ), Guinness Book of Records, Guinness, London, p. 61, 1983. Return to text. Whitcomb and Morris, Ref. 1, p. 264. Return to text. Morris, J.D., The Young Earth, Master Books, p. 95, 1994. Return to text. Austin, S.A., Grand Canyon: Monument to Catastrophe, ICR, Santee, California, 1994. Return to text. Baumgardner, J.R., Runaway subduction as the driving mechanism for the Genesis Flood, in: Proceedings of the Third International Conference on Creationism, Creation Science Fellowship, Pittsburgh, Pennsylvania, pp. 63–76, 1994. Return to text. Austin, S.A., Baumgardner, J.R., Humphreys, D.R., Snelling, A.A., Vardiman, L. and Wise, K.P., Catastrophic plate tectonics: a global Flood model of Earth history; in: Proceedings of the Third International Conference on Creationism, Creation Science Fellowship, Pittsburgh, Pennsylvania, pp. 609–622, 1994. Return to text. Reed, J.K., Bennett, C.B., Froede, C.R., Oard, M.J. and Woodmorappe, J., An introduction to modern uniformitarian and catastrophic plate tectonic concepts, Creation Res. Soc. Quart. 33(4):202–210, 1996. Return to text. Humphreys, D.R., Has the earth’s magnetic field flipped? Creation Res. Soc. Quart. 25(3):130–137, 1988. Return to text. Humphreys, D.R., Physical mechanisms for reversals of the earth’s magnetic field during the Flood; in: Proceedings of the Second International Conference on Creationism, Creation Science Fellowship, Pittsburgh, Pennsylvania, pp. 129–142, 1990. Return to text. Brown, Ref. 18, pp. 82–92. Return to text. Berthault, G., Genesis and historical geology: a personal perspective, CEN Tech. J. 12(2):213–217, 1998. Return to text. Julien, P.Y., Lan, Y. and Berthault, G., Experiments on stratification of heterogeneous sand mixtures, Bulletin of the Society of Geology, France, 164(5):649–660, 1993. Return to text. Baumgardner, J.R. and Barnette, D.W., Patterns of ocean circulation over the continents during Noah’s Flood; in: Proceedings of the Third International Conference on Creationism, Creation Science Fellowship, Pittsburgh, Pennsylvania, pp. 77–86, 1994. Return to text. Walker, T., A Biblical geological model; in: Proceedings of the Third International Conference on Creationism, Creation Science Fellowship, Pittsburgh, Pennsylvania, pp. 581–592, 1994. Return to text. Garner, P., Continental flood basalts indicate a pre-Mesozoic Flood/post-Flood boundary, CEN Tech. J. 10(1):114–127, 1996. Return to text. Hunter, M.J., Is the pre-Flood/Flood boundary in the earth’s mantle? CEN Tech. J. 10(3):344–357, 1996. Return to text. Garton, M., The real lifestyle of the dinosaurs, Origins 24:14–22, 1998. Return to text. Robinson, S.J., Dinosaurs in the Oardic Flood, CEN Tech. J. 12(1):55–86, 63, 1998. Return to text. Taylor, J., Fossil Facts and Fantasies, Mt Blanco Publishing Co., ch. 4, pp. 36–47, 1999. Return to text. Robinson, Ref. 41, p. 57. Return to text. Snelling, A.A., Catastrophic sedimentation: giant submarine landslides, CEN Tech. J. 12(2):135–136, 1998. Return to text. Snelling, A.A., Waterborne gravity flows buried Mongolian dinosaurs, CEN Tech. J. 12(2):133–134, 1998. Return to text. Garton, Ref. 7, p. 97–98. Return to text. Scheven, J., The Carboniferous floating forest—an extinct pre-Flood eco-system, CEN Tech. J. 10(1):70–81, 1996. Return to text. It has been argued that Psalm 104:6–9 (KJV) is referring to the third day of the Creation Week. However the context of Psalm 104:8–9 (KJV) is of a perpetual decree that the waters ‘may not pass over’ (Hebrew abhar). The parallel passages Isaiah 54:9 (KJV) and Jeremiah 5:22 (KJV) use the same word (abhar) and refer to the Rainbow Covenant concerning the sea not being allowed to cross over the boundary of the shore. Thus there is a good case that although Psalm 104:1–5 (KJV) is referring to Creation, Psalm 104:6–9 (KJV) is speaking of the Flood. Whitcomb, Ref. 2, p. 40–41. See also Taylor, C.V., Did mountains really rise according to Psalm 104:8? CEN Tech. J. 12(3):312–313, 1998, and discussion in CEN Tech. J. 13(1):68–71, 1999. Return to text. Berthault, Ref. 34, p. 216. Return to text. Rush, D.E. and Vardiman, L., Pre–Flood vapor canopy radiative temperature profiles; in: Proceedings of the Second International Conference on Creationism, Volume 2, Creation Science Fellowship, Pittsburgh, Pennsylvania, pp. 231–245, 1990. Return to text. Brown, W.T., The fountains of the great deep; in: Proceedings of the First International Conference on Creationism, Volume 1, Creation Science Fellowship, Pittsburgh, Pennsylvania, pp. 23–38, 1986. Return to text. Baumgardner, J.R., Runaway subduction as the driving mechanism for the Genesis Flood; in: Proceedings of the Third International Conference on Creationism, Creation Science Fellowship, Pittsburgh, Pennsylvania, pp. 63–75, 1994. Return to text. Andy McIntosh is Reader in Combustion Theory at the University of Leeds in the Department of Fuel and Energy, researching into fluids, explosions, ignition, and heat transfer. He read Applied Mathematics at Bangor University, North Wales, completed his Ph.D. in Combustion Aerodynamics in 1981, and obtained a D.Sc. in 1998. Author of many articles on combustion and fluids, Andy speaks widely on Creation, and authored the book ‘Genesis for Today’. Tom Edmondson holds degrees in music from Trinity College of Music (London University) and also a degree in history and philosophy from the Open University. Together with his wife he did linguistic and translation work among the Ejagham people of SE Nigeria and SW Cameroon with Wycliffe Bible Translators for a number of years. He is a founding member of the Bradford Creation Science Group. Steven Taylor is a Reader in the Department of Electrical Engineering and Electronics at Liverpool University. His Ph.D. thesis was concerned with the inductively coupled plasma oxidation of silicon. He has published over 100 papers in refereed journals and conferences in the field of silicon microelectronics, plasma processing and ion physics. He is currently Chairman of the UK Dielectrics Club and formerly a member of the Program Committee of IEEE Semiconductor Interface Specialist Conference.